You can spot receipts request disease in your customer support system. Every time we looked into helpscout at one of our companies, there it was in the unassigned tasks, waiting for someone to pull the short straw and have to deal with it. On the flip side, receipt requests are an issue for your customers. They need receipts to file expense reports (which is something they don’t want to do either). Your SaaS startup has receipts request disease, too. Last week we released Ramp Receipts. Ramp receipts was created because of an issue we noticed at one of our portfolio companies, Linktexting.com. Customer support continued to get requests for receipts. From my experience with MaxButtons I knew this issue well and how distracting it is to a company. Then we noticed that what we call ‘Receipts Request Disease’ had infected all of our companies. There is no founder who wants the hassle of creating receipts for a customer. First, getting the support email is a waste of time. Second, it is chore to crank out receipts by hand, going back and forth from the customer to ensure that get the receipt content is correct. Even if you bury this expense by using lower cost customer support, it still costs time and money. In the early stages of a startup the lowest cost resource is most likely the only available resource. Which means its the founders. So not only is it expensive, fielding receipt request questions rarely yields to the massive product improvement insights on which you should be working. Receipts request disease turned out to be one-third to one-half of customer support requests across our companies. To fix this at linktexting, we went about building a receipts section of the account page. When you start digging into the receipts that stripe gives you, you will face the challenge of customizing them. For example, do you want your receipts on stripe or on your site? We wanted our customers to stay on our site for the entire experience. At the Linktexting receipts dashboard, customers can see all of their receipts, view them individually, download PDFs, or print them. When we pushed It live there was silence. Our support folks glowed. It’s a week of dev full time to do this on your own. Or a year in startup weeks. Ramp Receipts gives you everything you need to cure your company of this insidious ailment. Colin from Mailshake created this beautiful receipts dashboard. His customers can enter whatever pertinent information they need on their receipts. 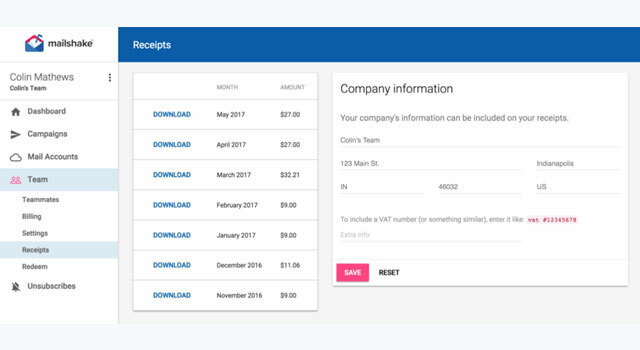 The Ramp Receipts API lets Mailshake include customizable information for company name, address, VAT Tax ID, customer support email and customer support phone. Once we locked down the API we released it for free on Ramp Receipts on Product Hunt. Since then, we have heard that this is a problem for almost all startup SaaS companies. Friends confirmed that is was at least a week of dev and that customer support folks had threatened to throw stuff at them if they didn’t get a week of dev time to fix it. With Ramp Receipts you can create a beautiful customized receipts dashboard in just a few hours, archive your Trello todo card to build a receipts dashboard card, and rid your company of a massive time and cost waste.